Over the past two weeks, I have published two posts dealing with Russia’s digital diplomacy apparatus. While the first post focused solely on Russia’s digital diplomacy reach, the second post compared between the social media reach of the US and Russia. However, both posts dealt primarily with the extent to which the US and Russia are able to attract twitter followers. While conversing with foreign populations is one of the goals of digital diplomacy, MFAs and embassies are also keen to attract journalists to their social media accounts. Journalists are a crucial digital diplomacy audience as they may dramatically expand the online reach of diplomatic institutions by sharing embassy authored content. Moreover, journalists may also use MFA social media accounts as sources of information when reporting on events and even embrace MFA stance on various issues. Finally, as the media may influence public opinion, diplomats routinely attempt to influence journalists. The US and Russia currently find themselves engulfed in two main conflicts- the fate of Ukraine and the Russian civil war. Their battle over public opinion is also a battle over journalists. 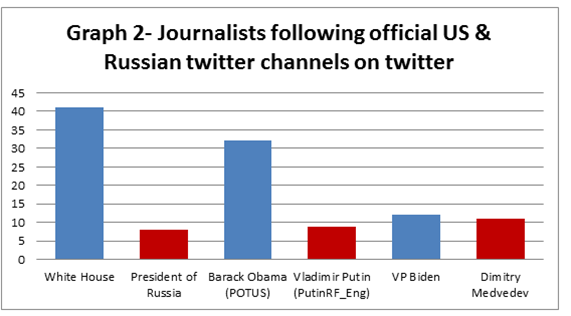 Therefore, this week I compared between the US and Russia’s ability to attract journalists to their twitter channels. To this end, I compiled a sample of 163 journalists and prominent news organizations throughout the world. The sample included editors-in-chief, senior editors, digital media editors, foreign news editors, foreign affairs commentators and foreign correspondents. 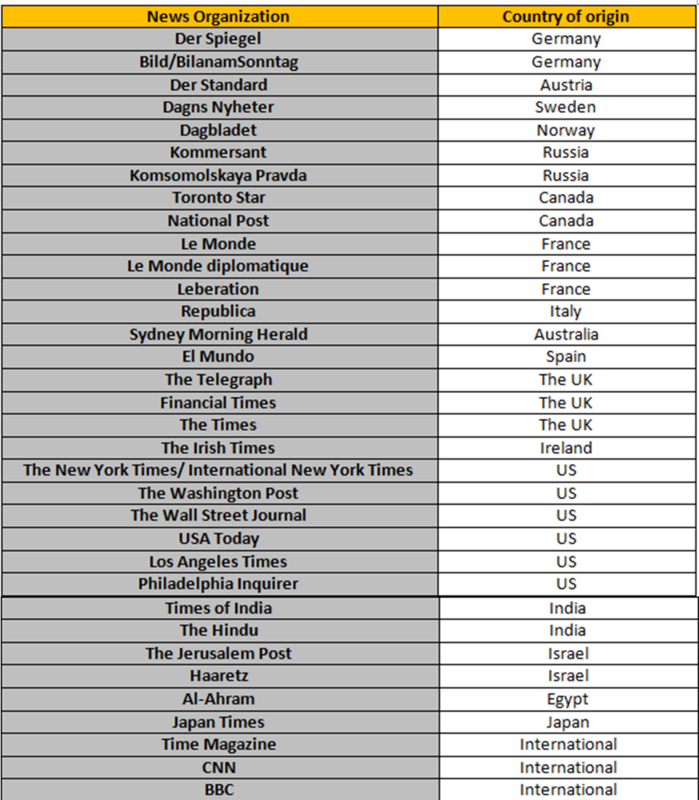 The table below details the journalists and news organizations comprising my sample. 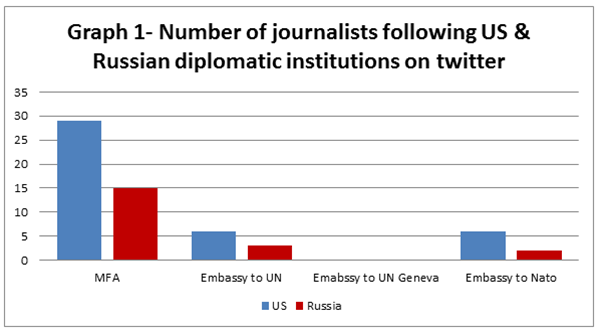 First, I compared between the amount of journalists and news organizations that follow US and Russian diplomatic institutions on twitter. The institutions in this analysis are those that deal with global issues and may therefore attract journalists and news organization from all over the world. These included the US and Russian foreign ministries, the US and Russian embassies to the UN in New York and Geneva and the US and Russian embassies to NATO. The results of this comparison may be seen in the graph below. As can be seen, the diplomatic institutions that attract the most journalists and news organizations are the Russian and US MFAs. Here, the is a sizable difference between the State Department, that attracts 28 journalist from the sample, as opposed to Russia’s MFA that attracts 15. Interestingly, both US and Russian embassies to the UN in New York and NATO attract few journalists yet in both cases the US’s reach among journalists is greater than Russia’s. Finally, neither the US or Russian embassies to the UN in Geneva attract any journalists or news organizations. Next, I analyzed the amount of journalists and news organizations from my sample that follow US and Russian official twitter channels. These include the White House, the President of Russia twitter channel operated by the Kremlin, the POTUS and Vladimir Putin channels and the channels operated by Vice President Biden and Russian PM Dmitry Medvedev. As can be seen in the graph above, in all cases the reach of US twitter channels surpasses that of Russian channels. As opposed to the White House twitter channel, that attracts more than 40 journalists in the sample, the President of Russia account attracts less than 10 journalists. Likewise, the POTUS account far surpasses the PutinRF_Eng account. The smallest gap is between VP Biden’s account, that attracts some 12 journalists, and Medvedev’s account that attracts 11 journalists and news organizations. The graph below, compares between the twitter reach of US and Russian embassies to six major world capitals: London, Berlin, Vienna (home to the OSCE), New Delhi and Kiev in which tensions between the US and Russia continue to mount. There are two findings in the graph above that warrant further elaboration. 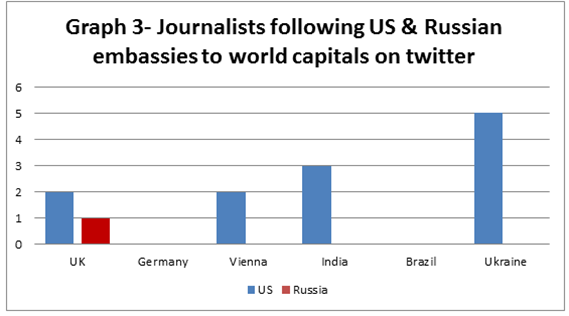 First, in four of the six capitals analyzed, US embassies are able to attract more journalists than Russian embassies. However, such US embassies seem to attract very few journalists and world news organizations when compared to the twitter accounts of MFAs and world leaders. The US embassy with the most followers is the Ukraine that attracts a mere five journalists, a surprising finding given the amount of news originating from Ukraine. In Germany and Brazil, both Russian and US embassies attract no journalists or news organizations at all. 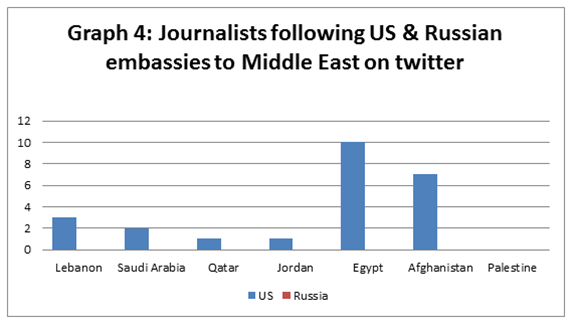 The final analysis, shown in the graph below, compared between the amount of journalists that follow the twitter accounts of US and Russian embassies to the Middle East. As can be seen, no journalists follow Russian embassies to these countries as opposed to US embassies. Yet as was the case in previous analysis, most US embassies (with the exception of Egypt, Afghanistan) seem to attract very few journalists. The results of the analysis presented in this post offer important insight. First, US digital diplomacy accounts seem to attract more journalists and news organizations than Russian ones. This is true when examining embassies, world leaders and other official channels. Major gaps between the US and Russia’s online reach were found in two important regions, the Middle East and Ukraine. As the media shapes public opinion, the ability to attract journalists to digital diplomacy accounts is of great importance to diplomatic institutions. These results suggest that the US may have broken ahead in the information war with Russia. In addition, the vast majority of Russian embassies evaluated in this post did not attract any journalists at all from the sample. This is an important finding with regard to the global reach of Russia’s digital diplomacy apparatus. However, even in the US’s case, most embassies evaluated attracted very few journalists. While attracting the local media may be important for a bi-lateral embassy than attracting the global press, some embassies deal with global issues. For instance, embassies to the UN in Geneva deal with a variety of issues ranging from human rights to weapons proliferation, intellectual property and global health challenges. Despite this fact, the US’s embassy to the UN in Geneva attracted no journalists or news organizations from the sample while its embassy to NATO attracted a mere 5 journalists. These results are of importance to both US and Russian embassies as well as to the UN HQ in Geneva and NATO HQ in Brussels. Moreover, it seems that world leaders and MFAs attract more journalists and news organizations from around the world than embassies. This raises an important question- are we witnessing a certain erosion in the status of the embassy as an information source for journalists? Answering this question calls for more in depth analysis. Finally, it should also be noted that the results of this post offer partial insight given the limited size of the sample used as well as a geographic bias as most journalists were from Western countries. Next week I shall be blogging about Palestinian digital diplomacy. Until then, tweet me @ilan_manor. Posted in Uncategorized and tagged Digital Diplomacy, diplomacy, journalism, journalists, Russia, Social media, Syria, Twitter, Ukraine, US. Bookmark the permalink.